It’s a daily hustle to grow a small business into a sustainable operation and entrepreneurs wear lots of hats from marketing to sales, accounting and finances. So with all of those balls in the air at once, who has time to focus on the nuances of design? If your business isn’t bringing in the cash you need, isn’t making it prettier the last thing you should be spending your time on? Good web design is way more than the cherry on the top of the cake. Design helps small businesses in everything from inspiring confidence with a professional image, to setting your brand apart from the competition, to attracting like-minded employees and even building financial value. Design can be your differentiator. If you let it. Let’s look at a few ways design can impact different areas of your small business. There’s a saying: Dress for the job you want, not the job you have. Amateur looks and designs damage your client’s confidence in you. Let me ask you this, which company are you more likely to give your money to? Even dentists need good design. You need to consider the image you want to portray if you’re going to make any lasting impact with anyone—clients, partners, investors. Whatever look you decide on, you need to exude the image of the business you’d like to be if you were your absolute best. This doesn’t just mean using a certain color scheme or copying what’s popular, but involves all of the points where a user will come in contact with your brand: your website, packaging, collateral, letterhead, etc. Users and potential clients respond to subtle, high-quality design by engaging with it, then forming connections based on their trust. Make some precise changes, with this in mind, and you’ll start to see the benefits, guaranteed. First impressions last. There’s nowhere this saying is truer than in the world of business. Seamless design that works the first time a user engages with it is critical to keeping that user around. Think about Apple, Airbnb, or Square. Each company has a unique, coherent design aesthetic that you can see from the second you interact with them or their products. 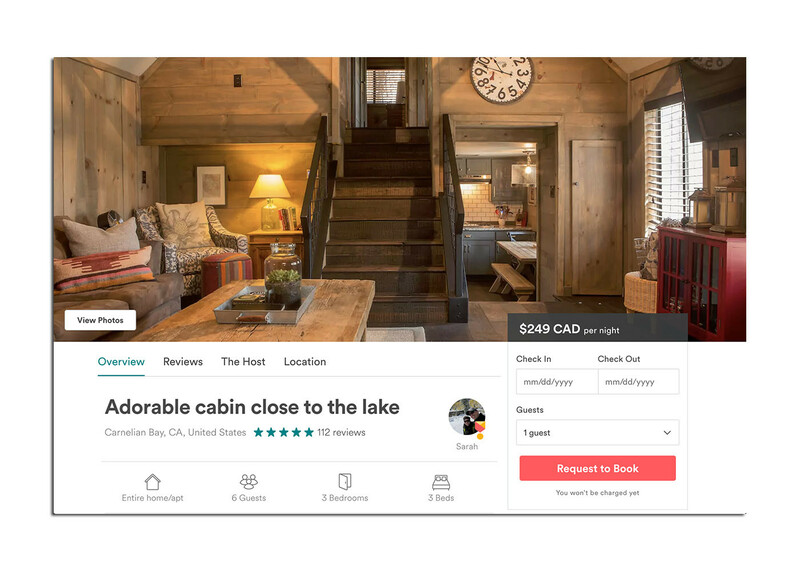 Airbnb assures a consistent user experience by providing a professional photographer to their hosts. You might think a visual aesthetic all over the place or with different styles can’t hurt anybody, a bad first impression can be costly to overcome. Save yourself the time and money you’ll spend later by investing in good design the first time. If there’s one piece of business advice that never fails it’s this: Make a great first impression and new business is sure to follow. Humility is a funny thing. Many businesses shy away from good design that would set them apart from their competition because they feel too exposed trying something outside of the norm. But in doing so, they fade into oblivion. Lost in the crowd of the familiar. Anything you can to do make yourself more memorable is more than just important. It’s crucial. People have less time to compare and choose between indistinguishable companies all following the same design trends—or simple copycats of each other, hoping to make quick work out of their designs without considering the damage they’re doing to their own reputations. Stand up and develop a unique image for your business. Give them something to talk about, and a reason to recommend your brand to other people, based on your captivating design alone. Don’t be afraid to differentiate and grow. In addition to everything else I’ve already mentioned, branding also makes referrals easier. New customers are the lifeblood of a smaller business, and the better you are at bringing them in, the more you’ll grow. Design keeps you memorable without jamming your message down your customers’ throats. More than just new customers, design helps you turn one-time users into repeat customers. Well-designed emails, landing pages, and even ads can be the difference between someone coming back to you or choosing a competitor. The people you hire will be your greatest asset. And design can help ensure you attract the best possible candidates. What’s nice about branding is that it sends up a sign to future employees and encourages similar attitudes in your hiring process. Bringing in employees with a shared vision for your business is easier if they enjoy and connect with your brand before they even apply. Once they’re hired, this connection helps to reduce turnover. More engaged workers means fewer replacements. This is even more important to small businesses, as selling the company’s vision helps create an impassioned workforce, ready to do what’s necessary to take the business to the next level. If you can inspire through design, you can build a company people truly want to work for. According to Forbes’ annual ‘The World’s Most Valuable Brand’ list, Apple’s ‘brand’ is worth $154.1 billion alone, while Google comes in at $82.5 billion, and Microsoft rounds out the top 3 at $75.2 billion. Your brand is an asset. Develop it properly, and it becomes something you can actually deal in. You’ll be able to sell it, along with your company, at some point in the future, if you choose. As your legal property, it’s more than just a fun way to make sales–it’s something you’ll be able to turn into a profit itself. But this doesn’t just happen on its own. Companies spend years cultivating a design aesthetic and style all of their own. The earlier you start, the better. Leo Almeida is a designer who loves advocating the benefits of good design and its impact on businesses. Download a free preview of his latest book, Growth by Design.